After a huge pause during my holidays ( part of them building LEGO sets, the rest just traveling and enjoying the beach… ), I am back with a bigger, better, full of sets and reviews and MOC to share with you. So here I am to review the LEGO Technic 9393 set. 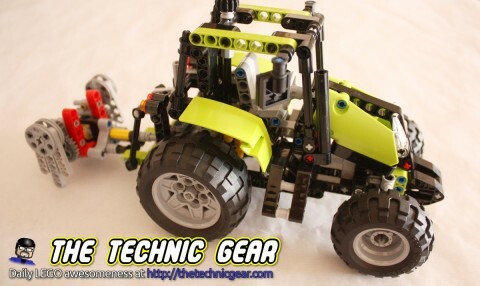 This sets features two models in one, as usual with most set of the Technic range; a green tractor and a interesting buggy. I will review first here the model A. Plow through the fields with this durable Tractor! Fire up the 2-in-1 Tractor to shred through the fields with working steering and a detachable tool that spins, then rebuild into a buggy! Tractor measures over 5″ (13cm) high, 11″ (28cm) long and 4″ (11cm) wide. Buggy measures over 4″ (11cm) high, 9″ (23cm) long and 5″ (13cm) wide. 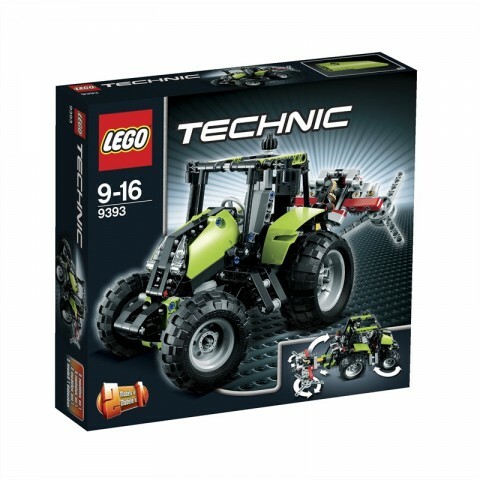 This is a very compact box for a Technic set. Most of the box is full with parts. It is just one book for each model, although the Tractor instructions booklet has around 60 pages. I started building this model just a few weeks after building the 8393 4×4 Rock Crawler and just a few days after an impressive F1 Grand Prix race car, so the building experience of this model is slightly different. Even with that it has been a very fun model to build with about one hour of building time. The model looks quite realistic and the tools on the back of the tractor looks great when moving. I suppose you can’t get anything better with so little LEGO bricks. So here it is my opinion. Little playability. It is quite hard to make it work. On my table the wheels slip over the table’s surface and often the crop tool didn’t move at all. I would buy it again but definitively there is better LEGO Technic models out there but of course they are more expensive too. Keep your eyes peeled for the review of the Grand Prix Racer here on The Technic Gear.